Mankind has not been gentle with trees. When humans began spreading across the globe, there were eight billion hectares of forests. We have cut down half. Our farmers have cleared the land and fragmented those forests that managed to escape the axe. Our industries have polluted the air and created acid rain. As we moved across the continents, we unwittingly introduced exotic species into existing forest ecosystems. And to make room for our constantly growing population we have cut down more and more trees … and continue to do so. Quebec is blessed with huge forests. They cover more than 750,000 km², accounting for more than half our territory, and are one of the province’s economic engines. But much of them has been lost. Since European settlers arrived, some regions have been largely cleared to make room for agricultural and industrial development, and for our demographic growth. 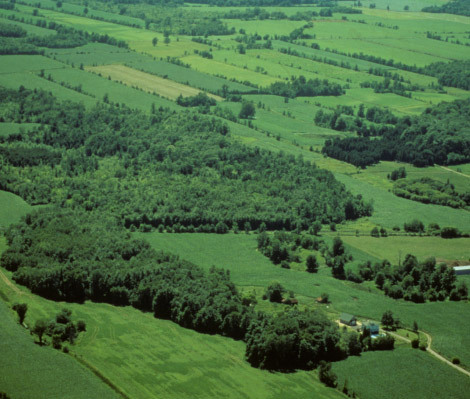 Forests now cover only 15% of the Upper St. Lawrence region, for instance. The history of this region might have something valuable to teach us about deforestation.